The course of an economy is determined by the course of that economy's money supply (broadly determined). 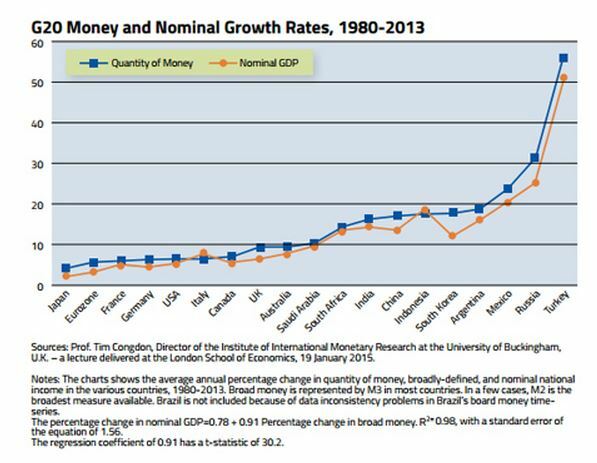 The relationship between money growth and nominal GDP growth is presented in the accompanying chart. It is persuasive. Indeed, money, not fiscal policy, dominates. 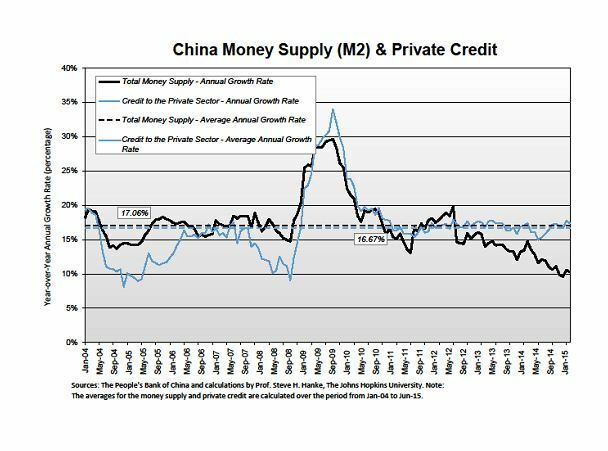 As I listen to all the ad hoc conjectures about the state of China's economy and its near-term prospects, I am astounded to never hear anything said about the most important determinant of nominal economic growth: the money supply. The second chart tells the tale. The picture is not a pretty one. China's money supply growth rate has been slowing down since early 2012. It now is growing at an annual rate of about 10%, which is well below the trend rate of money growth: 17.06%. China is in trouble. Slower money supply growth means that slower nominal GDP growth is already baked in the cake. Steve H. Hanke is a Professor of Applied Economics and Co-Director of the Institute for Applied Economics, Global Health, and the Study of Business Enterprise at The Johns Hopkins University in Baltimore. Prof. Hanke is also a Senior Fellow at the Cato Institute in Washington, D.C.; a Distinguished Professor at the Universitas Pelita Harapan in Jakarta, Indonesia; a Senior Advisor at the Renmin University of China’s International Monetary Research Institute in Beijing; a Special Counselor to the Center for Financial Stability in New York; a member of the National Bank of Kuwait’s International Advisory Board (chaired by Sir John Major); a member of the Financial Advisory Council of the United Arab Emirates; and a contributing editor at Globe Asia Magazine.